Althouh Alcalá is a city where lots of students and visitors come every year, it may be difficult to find original or beautiful souvenirs of Alcalá for your friends or relatives. Are you having this problem? Let’s visit El Reino de Micomicón. One of the things I love about Alcalá is that, because of the students learning Spanish, the foreigners living in Alcalá and the increasing number of tourists that come here every year, we, the alcalainos, have the opportunity to share our lifes with people from any other country in the world. It’s wonderful to walk along Calle Mayor or contemplate the Facade of the University while running into you. As a visitor, Alcalá is a great place to understand how the Spanish way of life is. What happens at 19:30 when the streets of the city center get filled up with Alcalainos going for a walk? Where else would you have a Tapa in a historical center being surrounded by Spaniards instead of just tourists? Probably because of Alcalá not being just a place for tourist, finding original souvenirs, something to gift that is not a simple magnet or postcard, may be a complicated task. This is why we have been pleased to come across El Reino de Micomicón. 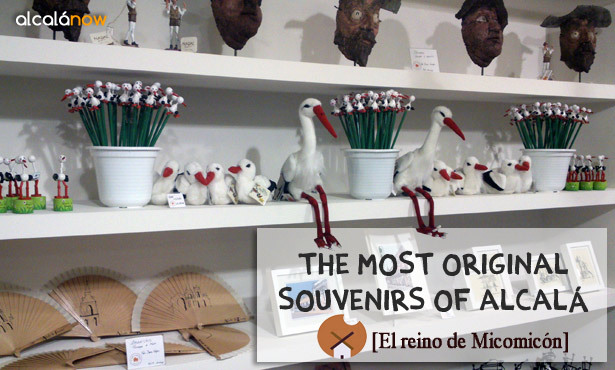 El Reino de Micomicón is a very special souvenir shop that aims not only to sell items for tourists but also to spread the art and culture of Alcalá. They collaborate with local artist and artisans by selling their works, which makes their articles very original. Did you know that the kingdom of Micomicón (Reino de Micomicón) is an invention of Miguel de Cervantes? He mention it in his novel Don Quijote de la Mancha. It is the place where the princess Micomicona comes from, and she is one of the principal characters of some of the book’s adventures. If you are looking for an original T-shirt of Alcalá that doesn’t have the logo of the University of Alcalá, this is a good place to go. 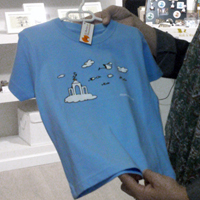 They have T-shirts with drawings of Calle Mayor, Storks, etc, most of them being designed by the owners of the shop (María Aranguren y Diana Díaz). I’m sure you’ve seen the stone bench in front of Casa de Cervantes that has two sculptures, one of Don Quijote and one of Sancho Panza. Probably, you even have a nice photo with them. 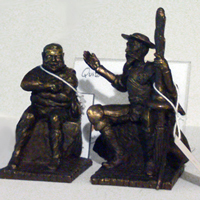 Pedro Requejo is the sculptor of Don Quijote and Sancho, and also the author of this bench’s miniature. Isn’t it a great idea?A miniature of the most photographed bench in Alcalá!! 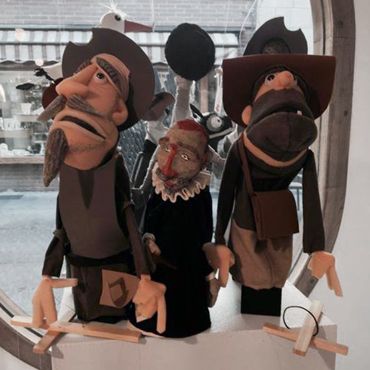 The marionettes of Don Quijote and Sancho seem like an original and enjoyable gift. Let’s play with them! This is our favourite! Storks are very popular in Alcalá, they stay here all year long. We wrote a post about them because we love storks and so does Storky, our mascot. Reino de Micomicón has lots of storks: pencils, small cuddly toys, figurines, and real-sized cuddly toys!! 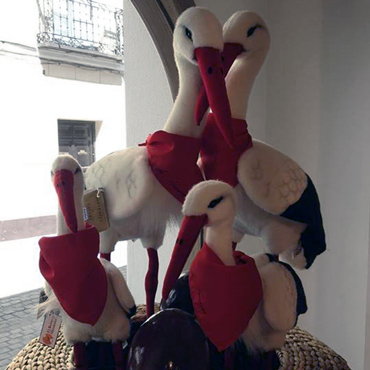 Storks are a good idea for a small gesture or a big present. You may not have seen it, but Reino de Micomicón is placed in the city center, next to Calle Mayor. The address is C/Carmen Calzado nº3. We hope you like it! AlcalaNow has freely decided to write this post, and it doesn’t receive any kind of remuneration from El Reino de Micomicón. The aim of AlcaláNow is to find places and resources that are useful to you and can help you to enjoy our city. In this case, we believe this is a good place to get a souvenir for your friends so that in the future they come to visit Alcalá too.